That is the best example for the obstacles that appear when you want to influence test ordering habits. You know that bleeding time is already an obsolete technique, and you know there’s no need to order a full bag of tests prior to minor surgeries. You have a wall built of insufficient desire, knowledge and bad habits in front of you. And when you finally resolve the obstacle and you find yourself on the other side of the wall, it’s still not enough. Everything stays the same. The lights are on, but there’s no one home. You’re still obligated to carry out tests that make no sense, and you send information that have no value. What if I told you that there is a solution? The solution are tactics which will help you cross over the wall much easier and be immeasurably more effective. These tactics are being used by the most successful hospitals/laboratories around the world. The use them to enhance their processes, and remove all negative effects of incorrect laboratory tests ordering. Even better, in this post I will show you every successful tactic, but I’ll also tell you which tactics you should definitely avoid. If you’re trying to solve the problem with tactics that give no results, that will only discourage you and you’ll lose your faith and energy. And the worst thing is that the problem still remains. And it’s not an “ordinary” problem. 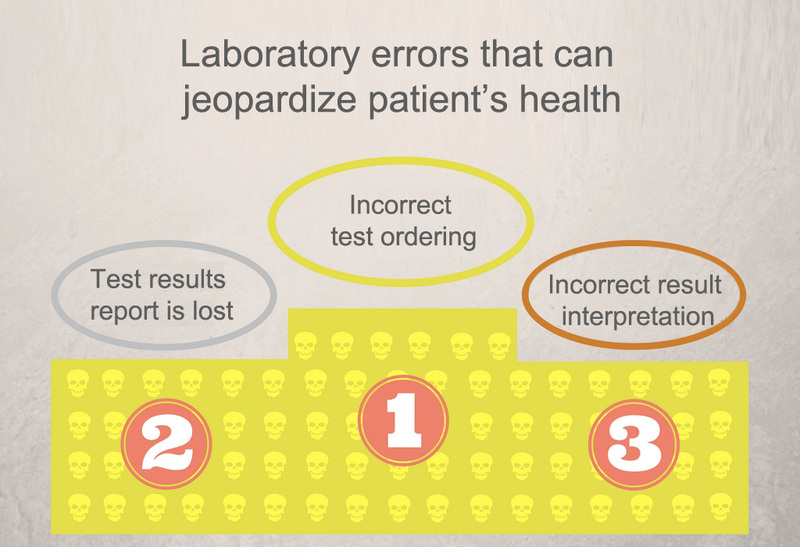 Among all errors, incorrect test ordering has the most negative effects on patient’s health. If you “find yourself” in one of these bad tactics – you’re not alone. They are traditionally used in medical institutions. That can only be a sign of your good intention to solve this problem. Seminars, gatherings or whatever you want to call them. You surely know how these events look like. Colleagues from different departments gather up to discuss test ordering problem and introduction of new tests. This can’t be done without some FOOD, SNACKS and 80% of people who aren’t interested in the topic. It has some advantages as well. You get to see your colleagues after some time, and you meet some new people. You sit there, together, and listen to someone presenting everything you need to know about the new test which will replace the old one. But in the end, it all ends up with just another story and some FOOD AND SNACKS. There’s no structural impact, and no real changes in the process. Memorandums are the main “form of communication” in organizations with non-existing communication. When you’re angry with someone or you don’t speak with him at all, then you’ll send him a memorandum. 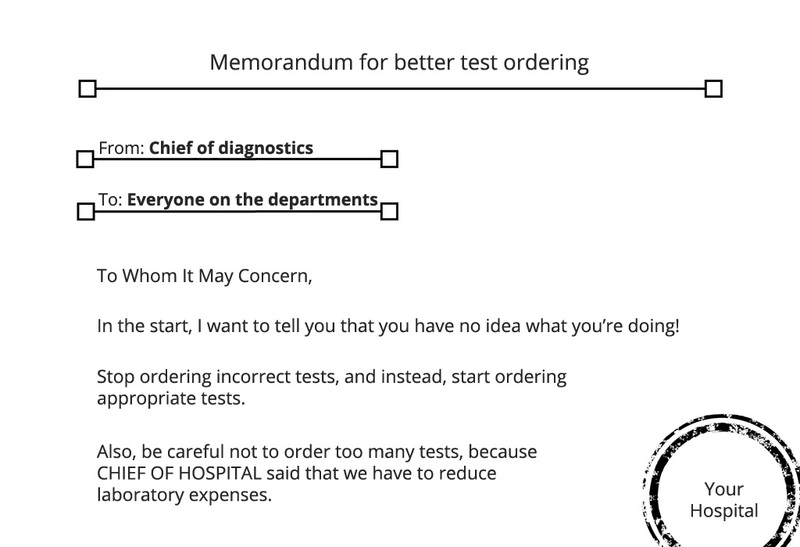 When we’re talking about ordering the incorrect tests, it comes as a direct consequence of laboratory or diagnostic staff’s justified discontent. Regardless if it’s justified or not, doctors don’t react on orders and they won’t accept any complaints not backed with evidence. If the memorandum is backed with an initiative to reduce expenses (as the case is in the image above), then there’s an even bigger chance that the memorandum will end up in a trash can. In the eyes of a doctor Saving Money = Worse Treatment Quality. Still, later in this post, you’ll see that when someone imposes their will, it can sometimes work. But not by using memorandums. Memorandums just make doctors angry, and leave them free to work the same as they did before. Incorrect test ordering isn’t like global warming. This is definitely a problem that can be solved. There are numerous examples of top hospitals and laboratories that already eliminated the problem of incorrect utilization of laboratory tests. In the continuation of this post, you’ll see which tactics they used. 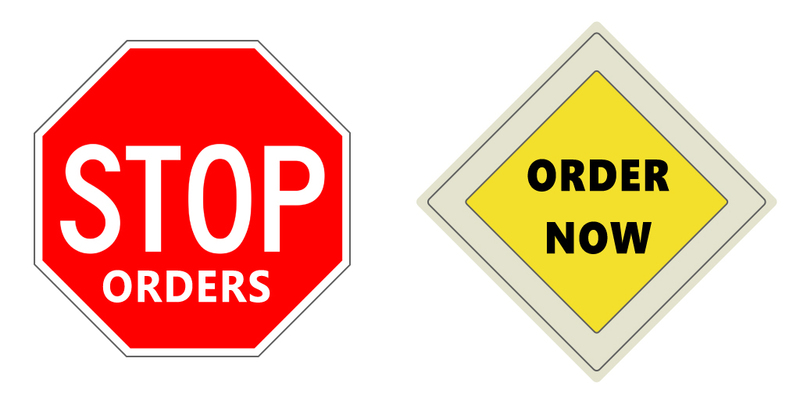 Simplify the ordering process of the tests you want to be ordered. Complicate the ordering process of the tests you don’t want to be ordered. The rule: Once you change your forms to stimulate more precise test ordering, destroy all of your old forms. Burn them if they are on paper, have the IT programmers remove them from your information system code. Do you want to give every doctor the possibility to order every single test? That’s probably not such a good idea. In some situations, it’s better to give someone a privilege. Once you gave the privilege to someone, you allowed him, exclusively, to order a specific type of tests. Example: Only a gastroenterologist can order a larger panel for celiac disease. Everyone else can order only tissue transglutaminase and IgA level. Only a gynecologist or a genetic consultant can order invasive prenatal tests. You’re smart, so I’ve said enough. Prohibition is even more radical than giving privileges. Forget memorandums. If imposing your will is the only way to get things done, then ordering tests, then prohibiting test ordering is a more effective option. As you’re already trying to convince your management to give your support, and you’re risking negative atmosphere, then do it with some style. Prohibit carrying out that obsolete test, and remove it from the ordering list. Radical tactics work, but not exclusively. One of the tactics that has a great impact is the “I Need Help” tactic. This tactic implies that ordering any complex test needs to initiate consultation with the corresponding expert. The knowledge of pathology, genetics, microbiology, biochemistry, and hematology experts won’t be wasted. The rule: In order for the “I Need Help” tactic to be successful, it’s crucial to decide which tests cannot be ordered without consultations. With no rules, results are highly uncertain. It’s not a rare case that laboratory “people” try to point out the abnormalities in ordering process, but it’s a rare case to see doctors to accept those critics in a good manner, and acknowledge their own mistakes. By nature, people have a certain aversion towards those who evaluate their actions (doctors even more). 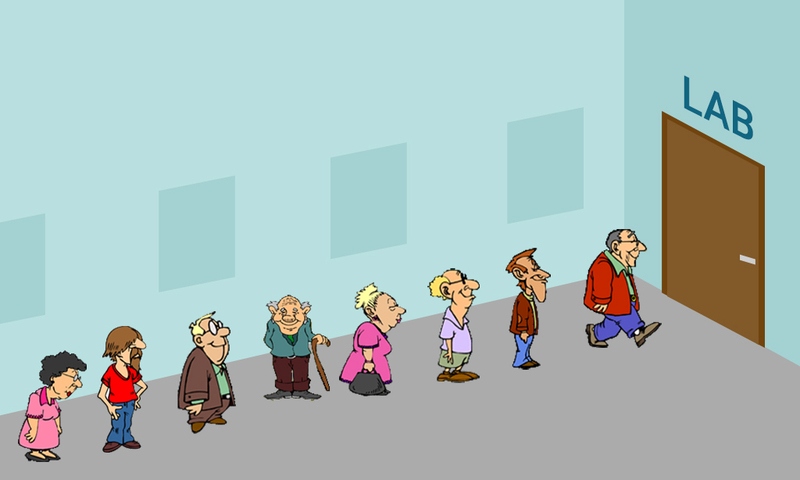 For doctors to spend 5 minutes of their time on some information, that information has to be heavily backed with data. Without tangible data, it’s just divination or assumption. The rule: All mentioned tactics have this type of analytics. That’s the best way to identify changes, whether they’re positive or negative changes. Let’s be frank, there’s no clear path for correct test ordering every time. Also, there’s no doctor with perfect intuition in every situation (maybe Dr. House). It would be ideal if most decisions could be made based on proper recommendations. In situations where our “dices aren’t arranged”, doctors should come up with a bright idea and propose an alternative solution. In reality, situation is much different. Doctors usually have no guidelines for ordering tests. Even when they do, those guidelines are complicated as the most of medical documents are. A lot of text, just a few answers. That forces them to rely on their intuition and the things they learned a long time ago. Their algorithms are presented visually. That’s how they made it possible to have the newest guidelines every time someone orders tests, and to provide answers quickly and in the right moment. Useful resources: Take a look at all algorithms that Mayo Clinic Medical Laboratories use for diagnosis and monitoring of various diseases. You reached the “beginning”, and that tells me enough about you. Only few people have enough courage, energy and motivation to read this post until the “beginning”. Even fewer have the courage to think about these tactics and try to implement them. 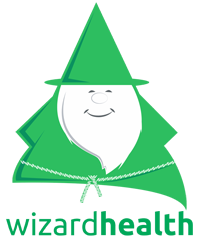 Now you know the most efficient tactics for a fact, and you have the dices to assemble, and adjust to your environment. 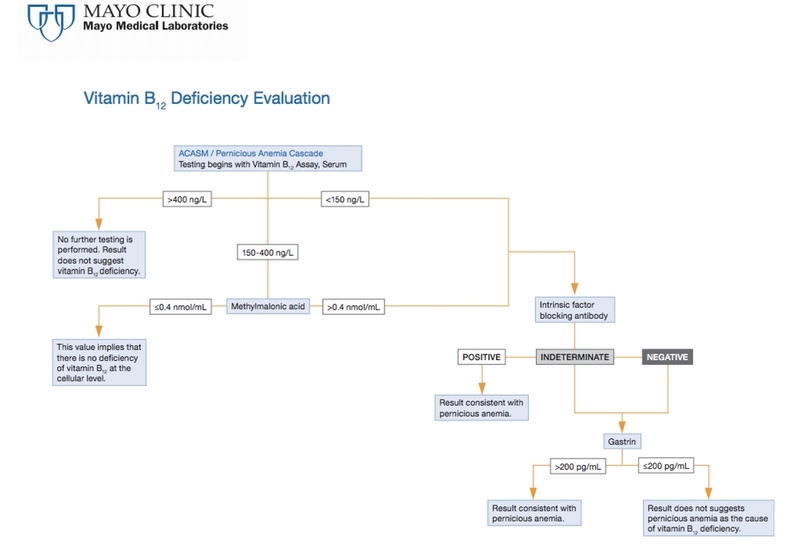 On this slider you can see how Cleveland Clinic combined different tactics for ordering genetic tests in their laboratory. But that’s what differentiates a modern laboratory from “just” a laboratory.